In this tutorial, we will write a python script to compute the electron and phonon dispersion curves of an armchair GNR, and then the momentum relaxation rates for absorption (ABS) and emission (EM) of both acoustic (AC) and optical (OP) phonons. The informations of the electron spectra are now stored in the matrix energyE. Note that in the code the longitudinal electron wavevector is kx and the longitudinal phonon wavevector is defined as qx, whereas, for what concerns the transverse wavevectors, we use kyE for electrons and qy for phonons. Instead the couple (qx0,qy0) indicates the specific point of the reciprocal space where the graphene branches are computed. 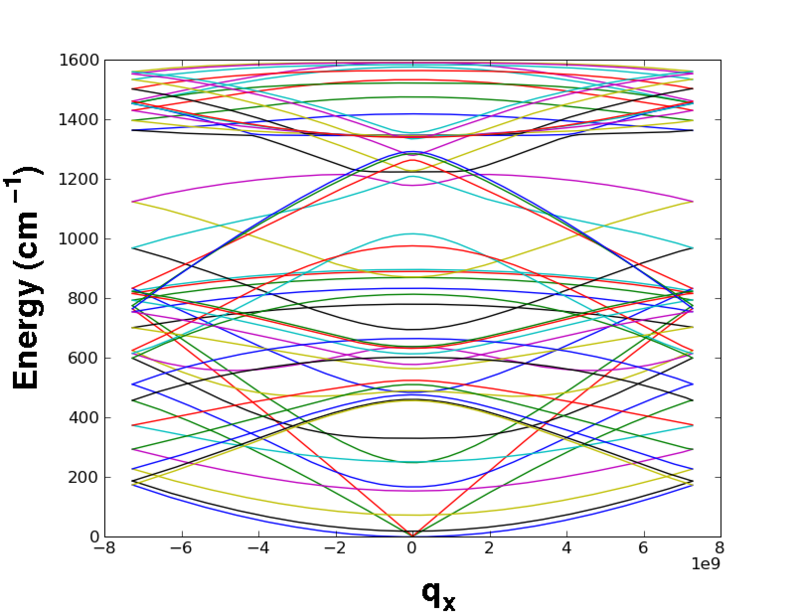 Of course kx=qx: the discretization is the same. 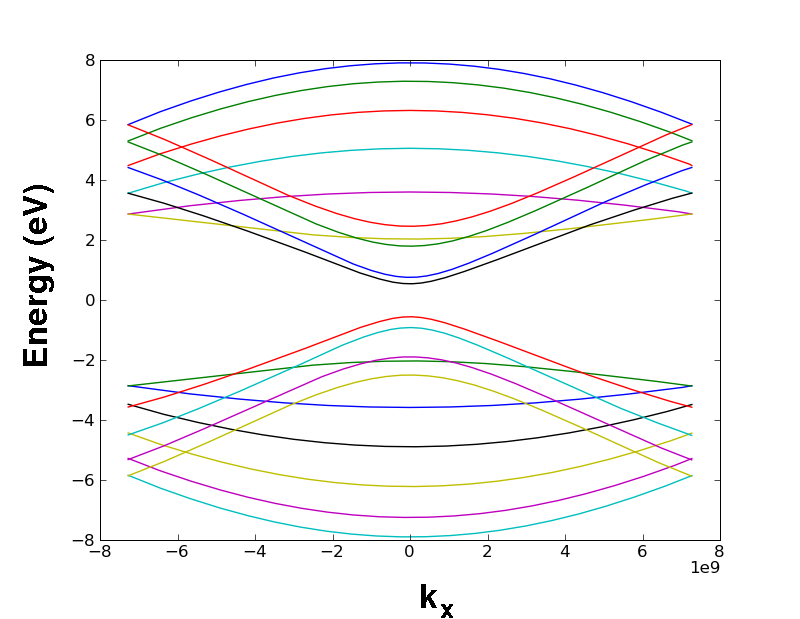 The quantities kx,qx,kyE,qy,qx0,qy0 are obviously attributes of the class a, as described in GNRphonon. Once the electron and phonon dipersion curves are known, we can compute scattering rates. As explained in GNRphonon, it is possible to simulate both LA and TA modes within the Deformation potential approximation (DPA) by setting numberAC=2, wherenumberAC is an attribute of the class a. By imposing numberAC=1, only the effect of LA modes on electron transport is taken into account. When computing rates, it is also possible to choose a sampling along the kx direction by setting the value of delta, an attribute of a. It is important to understand that rates are only computed for energies smaller than a specified electron energy Ecutoff, which is an attribute of the class a (see GNRphonon). This involves that for electron subbands higher than Ecutoff the corresponding scattering rate rateAA is zero for all initial electron energies in the subband. Rates are different from zero for only the lowest electron subbands, having a quantum number m generally close to (# of dimer) / 2. For example, for (# of dimer)=10, m=6 and m=7 correspond to the first and the second subbands, respectively. phonon_graphene(a)The graphene phonon energy are expressed in cm-1 (1cm-1 = 0.124 meV).